Audi said it will begin integrating automated toll payment technology into its U.S. vehicles later this year that will allow drivers to pay tolls without the need for an additional device. The integrated toll module is built into the vehicle's rearview mirror, which is supplied through Gentex, and can be controlled through the vehicle's on-board infotainment system. Audi, in a statement Wednesday, said that the module is compatible with 98 percent of the toll infrastructure in the United States, as well as toll roads in parts of Canada and Mexico. Consumers establish an account for their vehicle online through Gentex, which coordinates with electronic toll collectors across the country. 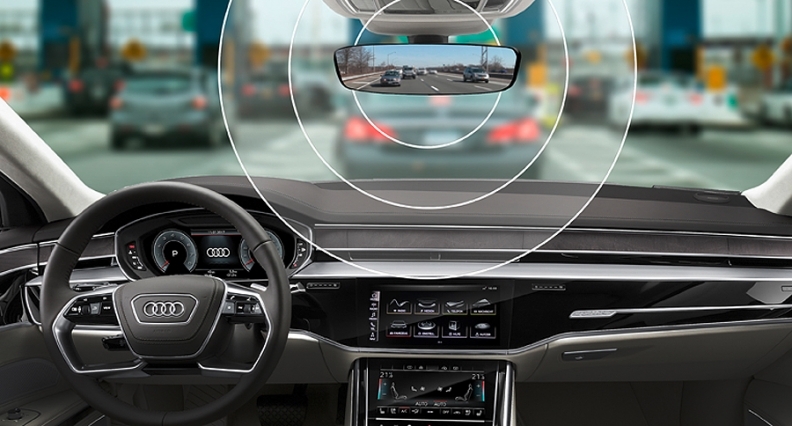 Integrating the module into the rearview mirror eliminates the need for an ancillary device that would clutter the windscreen and reduce visibility. It also eliminates the need for multiple automated collection devices in regions where municipalities use different electronic vendors to collect tolls. A spokeswoman for the brand declined to say which vehicle the integrated toll module would launch on, except to say that it would be later this year and limited to North America. The Q8 crossover is expected to launch in the latter half of this year. She did say it was likely that the technology would spread across Audi's U.S. lineup. Audi said drivers would be able to adjust mobile settings through equipped vehicles' infotainment systems, including turning the device on and off and changing the occupant settings for high-occupancy vehicle lanes.